This easy eggnog recipe is one of my favorites. 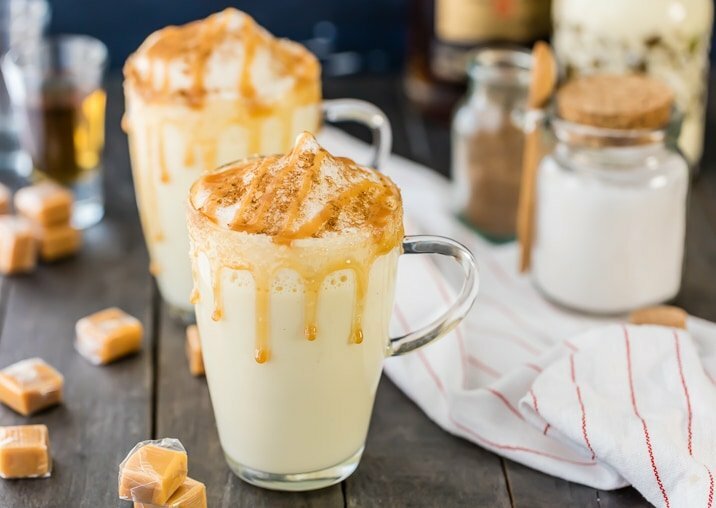 Salted Caramel Eggnog is so delicious, it’s the perfect way to celebrate the holiday season! I dream about this Salted Caramel eggnog recipe ALL YEAR LONG! Holiday drinks are always the best drinks, and eggnog is my FAVORITE holiday drink ever. It’s such a comforting, nostalgic, festive thing to sip on throughout fall and winter, especially at parties or holiday get togethers. It instantly makes any party feel special. 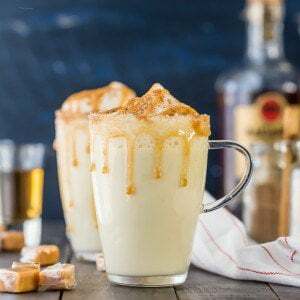 This easy eggnog recipe is EXTRA special because it’s filled with the beautiful flavors of cinnamon, nutmeg, sea salt, and (of course) caramel. It’s the perfect balance of sweet and salty. It’s even better when it’s topped with whipped egg whites, caramel syrup, and extra cinnamon. YUM! 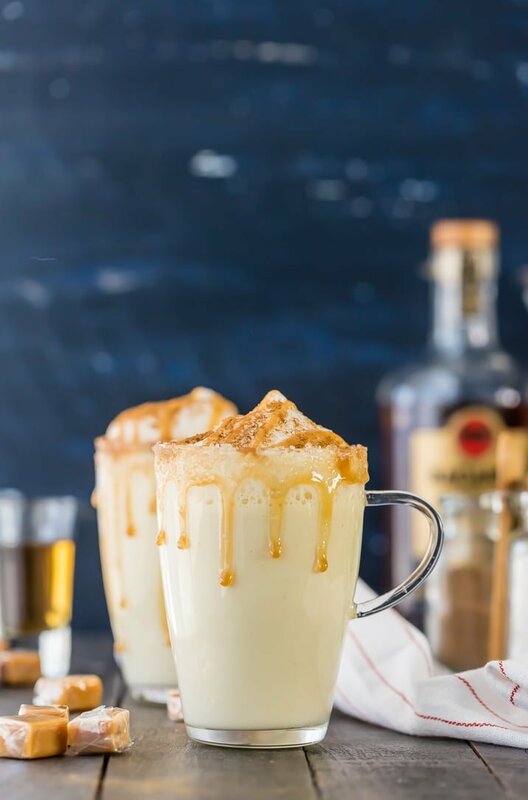 This Salted Caramel Eggnog Recipe can easily be made with or without rum. So if you want an alcoholic eggnog recipe, we’ve got you covered. And if you want to share it with the whole family, no worries! 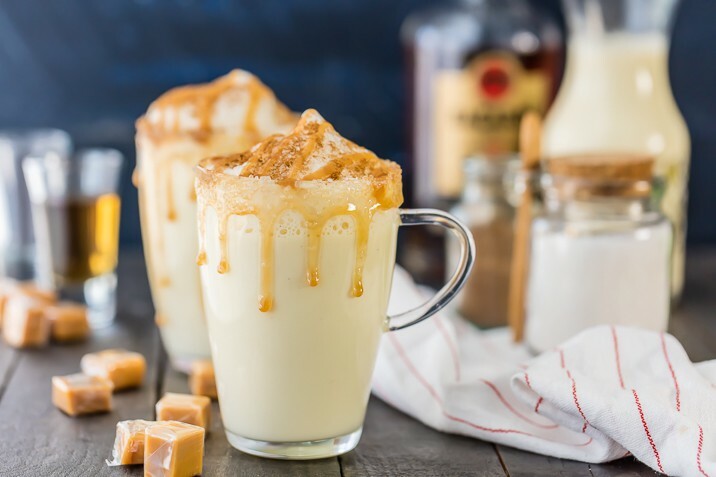 Just exclude the rum from the recipe and you’ve got the same great caramel flavor. 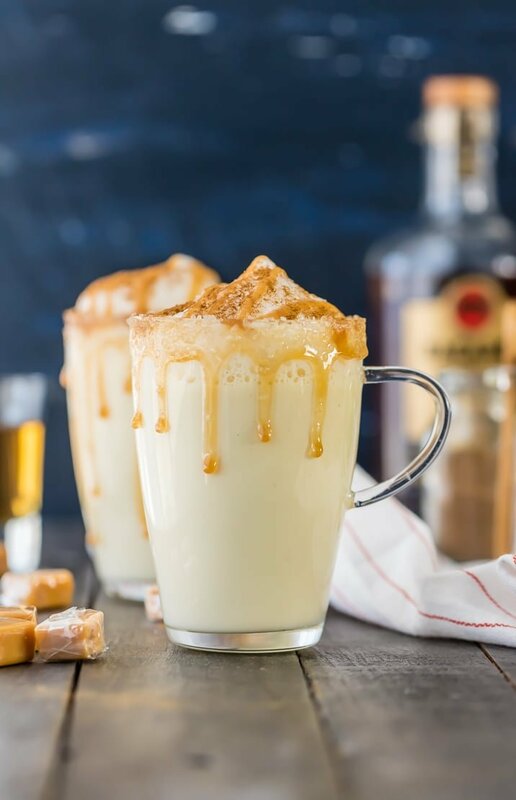 Make this delicious Salted Caramel Eggnog (with or without rum) for the holiday season. This easy eggnog recipe will be your new favorite! So call me crazy, but I had NO CLUE that making eggnog on the stove was maybe the most super simple thing ever. I assumed eggnog had to be made over hours and hours and could only be bought in stores (I KNOW). Well…good news everyone, that’s not the case. This easy eggnog recipe is super fast (like, under 15 minutes), and so delicious and comforting. Thanksgiving and Christmas in a glass. 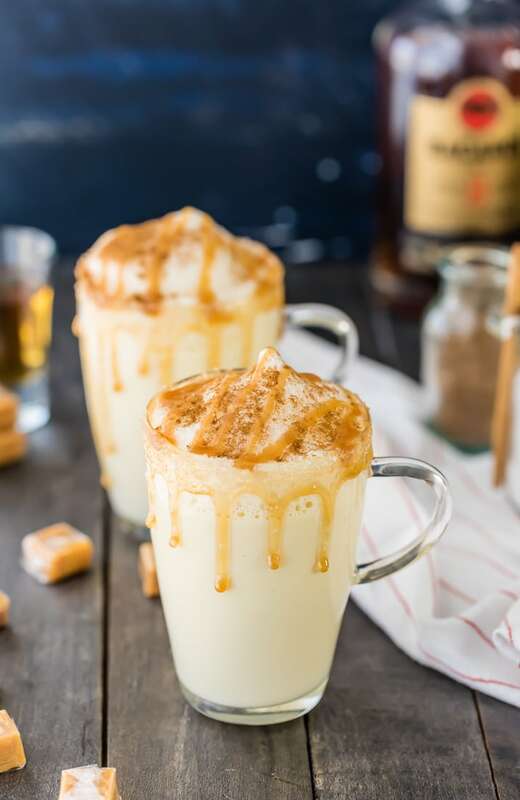 I love the added flair the salted caramel brings to this classic drink. It’s just too good! This easy eggnog recipe is made in just minutes, you won’t believe it! I always thought I had to buy eggnog at the store…because clearly I’m not qualified to make something of this class and taste in my own home! But it’s so much easier than I thought, and I’m officially addicted. 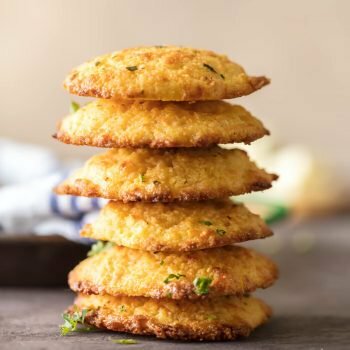 I especially love that this recipe can be made with or without the rum, so you can choose to make it for the whole family, or for adults only. Combine milk, cream, cinnamon, vanilla, and nutmeg in a saucepan and heat. Remove from heat as soon as it starts to boil, then let it sit 5-10 minutes to cool. Beat eggs and sugar in a stand mixer, then pour it into the milk mixture and whisk quickly to combine. Mix in caramel and sea salt (and rum for alcoholic eggnog version). The eggnog is ready to pour and serve at this point. If you’d like to get a little fancy, beat egg whites until they’re fluffy and start to peak, then add them on top of the eggnog. Don’t forget to garnish with extra cinnamon and caramel syrup! Check the recipe card for detailed instructions. I LOVE eggnog. It’s so creamy, so rich, and so flavorful! It feels like such a fun and decadent thing to sip on, which makes it feel extra special and totally worthy of holiday parties. This Salted Caramel Eggnog might be my new favorite version (possibly the BEST eggnog recipe?). Not only is this a super easy eggnog recipe, but it’s just so tasty. I love the sweet and salty aspect, and it’s just so much fun to drink (with or without alcohol). I hope you love this easy Salted Caramel Eggnog recipe as much as I do. 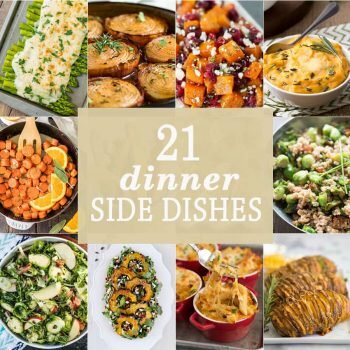 It’s so delicious, and it’s such a fun thing to share with friends and family around the holidays. See the recipe card below for details on how to make this Salted Caramel Eggnog recipe. Enjoy! I had NO IDEA you could make eggnog on the stovetop, either, but man. Now that I have this knowledge, I know what we’ll be drinking throughout these coming months. 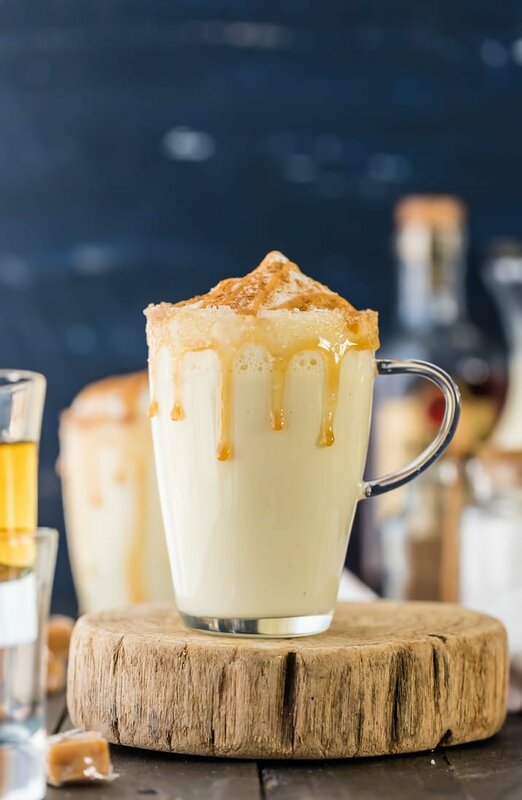 This Homemade Salted Caramel Eggnog is STUNNING, and I cannot wait to try it! Thank you Erin! So sweet! I don’t really love eggnog, but THIS!!! I must try it! I am SO making this for Christmas! Looks so delicious! Thanks Marsha! Hope you love them! I kinda turn up my nose at the thought o Eggnog but this, now I could totally get into YUM! Oh these are so on my list for holiday drinks Becky! Egg nog is delicious, but salted caramel egg nog is better!! Thanks for sharing! Yay hope you love them Mary Ann! What a beautiful photo. I didn’t know eggnog was this easy either! I thought only Martha Stewart made her own eggnog.. looks like Martha should watch her back :) Looks AWESOME! HA!!!! Me and Martha. Two of a kind (NOT) This is SO easy!!!! I seriously had to stop myself from licking the screen! Oh My Word Becky this is totally the Bee’s Knees! Thank you Chandra! So sweet! 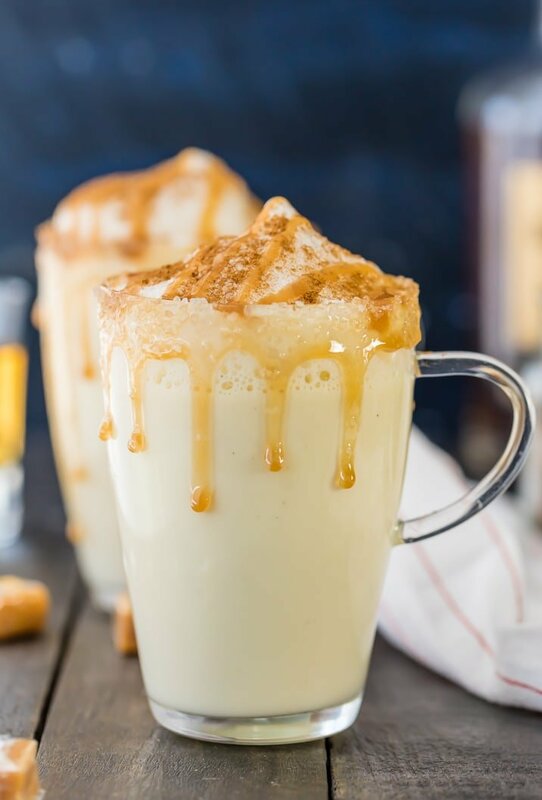 I love homemade eggnog and this salted caramel version would quickly become my fav! !